Go floral and complement Nature’s beauty. Natalia of In The Writer’s Closet looks dreamy in a floral coat with three-quarter sleeves. She blends with Nature and stands out at the same time, in her colorful style. The purse is a gorgeous addition. When it’s still winter but your jacket needs a fresh look. Tiina of Elegance Revisited lives in Finland and England – Finland in this pic. She wrote that she’s well and good tired of her winter jackets. So she added a studded belt to this one and got a whole new look. Except for that snow, that snow’s been there a while. Belt a coat for a new look. Go classic and classy in simple navy. 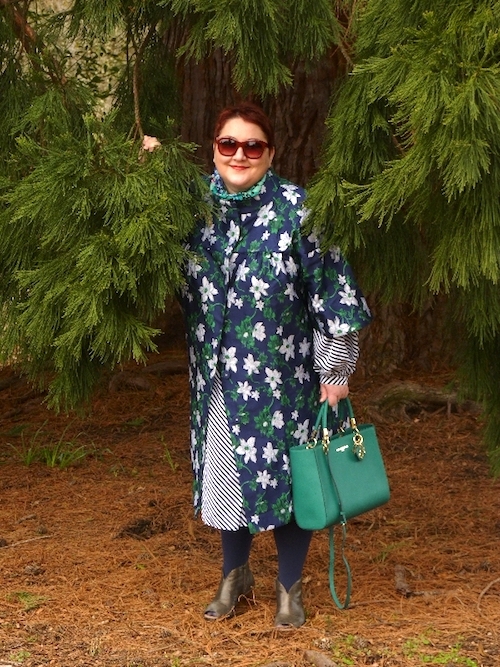 Sue of High Heels In The Wilderness looks terrific in a Moncler anorak. It’s smart against her Spring whites and she informed us that anoraks are totally the “it” jackets this year. Sue left this one behind, as she’s looking for more of a trench coat, but I like this casual classic look. Sue could be a model for these timeless pieces. A cozy long cardigan is a super transition piece. Shelbee of Shelbee On the Edge needs a coat, standing out in that white stuff! But what do I know living here in tee-shirt land? She chose a year-round topper, a trustworthy long navy cardigan. Love the cardigan over a Spring dress! Love, love the tights and boots with this look. Go all shiny, and dazzle your fans. Melanie of Bag And A Beret always amazes with her original, personal style. 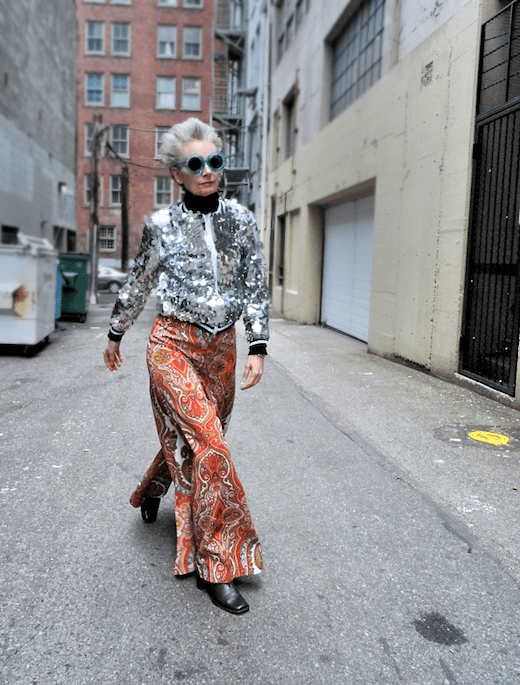 This silver paillette jacket is brilliant with her vintage flares and sunglasses. And as per always, everything is thrifted or created by Mel. Mel’s most excellent hair goes beautifully with the jacket. Always right: a Chanel-style jacket. 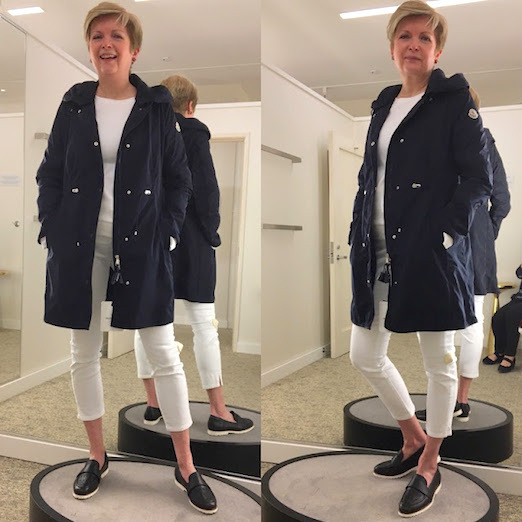 Gail of Is This Mutton chose a timeless tweed jacket in Spring white. The pearls complement it perfectly, and Gail can wear this anywhere. It looks super-fresh and Spring-y with her dotted skirt here. Lots of wardrobe mileage to be had from this jacket. Thanks for including me, Patti. I’m going back to get that anorak next week. I’ve sworn off trench coats entirely now;) Happy Easter. 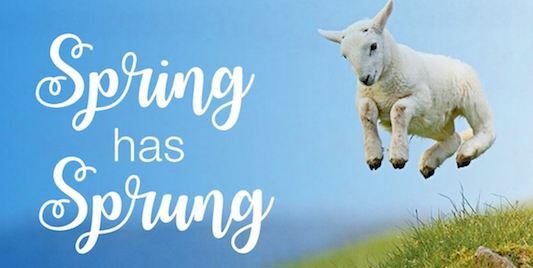 I love a good spring jacket! I’m always cold and it’s a fun way to jazz up an outfit! Oh, so beautiful spring jacket! I love floral jacket, very pretty! Every single one of these jackets hit a high note with me. They’re so fun and lovely that my jacket addiction is itching to go out and buy similar styles. If only I had the closet space to hold them all! Gotta love jackets of every size and shape!! Usually we need them in the mornings, and then can throw them off in the middle of the day!!! Today? I’ll need my every minute! !